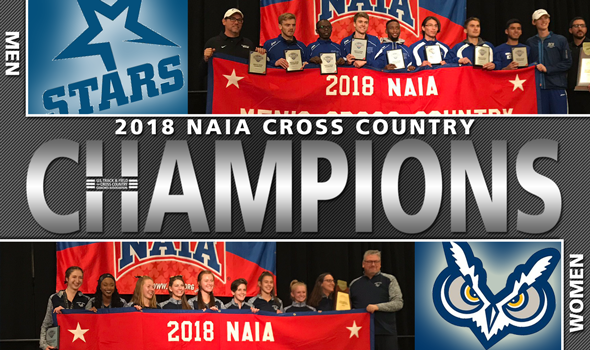 CEDAR RAPIDS, Iowa – The men’s program from Oklahoma City and the women’s squad from Oregon Tech were crowned the 2018 NAIA National Champions while Cornerstone’s Colin De Young and Point Park’s Anna Shields won the individual crowns on the men’s and women’s side respectively at the 2018 NAIA Cross Country Championships at Seminole Valley Park on Friday morning. The Oklahoma City men won its fourth NAIA Championship and third in the last five years with a 116-point performance. It was a 27-point margin of victory over the second-place program. The Stars were paced by Max McNeill in ninth (24:43.5) and Oscar Kipkros in tenth (24:47.0) as the group had the No. 9, 10, 33, 37 and 56 placed finishers. Rounding out the top-five for the men was Indiana Wesleyan (143 points), St. Francis (Ill.), Southern Oregon (181) and St. Mary (Kan./218). Cornerstone junior Colin De Young took the men’s individual tile with a new personal best mark of 24:12.4. It is De Young’s fourth straight victory in a meet this cross country season. The Oregon Tech women won its first ever NAIA Championship in program history by taking the top spot by just six points in a highly-competitive race. The top-three teams in the championships were separated by just eight points in one of the closest championships races in recent memory. The Oregon Tech women took the meet with 126 points but were trailed by strong showings by Madonna (132 points) and Taylor (134). Oregon Tech got strong performances from Susie Garza in fourth (17:36.1) and Cindy Reed in fifth (17:37.0). The Owls also had the No. 12, 59 and 68 finishers to round out their scoring attack. The remaining top-five on the women’s side consisted of Southern Oregon (192) in fourth and SCAD Atlanta (241) in fifth. Point Park senior Anna Shields closed her cross country career with the individual crown after posting a 17:15.9. It is her third consecutive individual victory in a meet to close out the year and her first career national title.